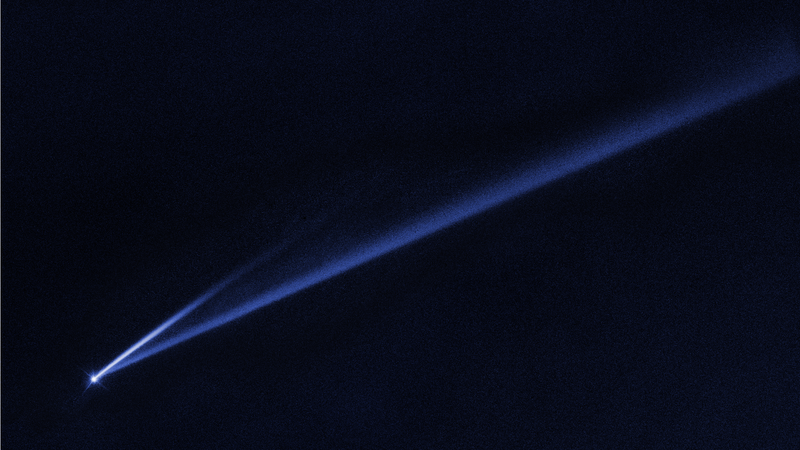 Active asteroid Gault, and its two new tails—a sign that the object is beginning to disintegrate. The object in question is known as asteroid (6478) Gault, and it has been known to astronomers since 1988. Gault is located about 214 million miles (344 million km) from the Sun, and it’s about 2.5 miles (4 km) wide. Up until now, it was just an ordinary, boring asteroid, but as new research set to be published in The Astrophysical Journal Letters shows, Gault has entered into self-destruct mode on account of its rapid spin. Using the Hubble Space Telescope and other observatories, astronomers confirmed two distinctive material shedding events, one around October 28, 2018 and a second on December 30, 2018. This resulted in a pair of streamers that now trail behind Gault in a very comet-like manner. This recent and unexpected activity now classifies Gault as an active asteroid, as opposed to a run-of-the-mill asteroid that just floats idly in space. Active asteroids are quite rare. To date, only around 24 active asteroids have been observed by astronomers, and at a paltry rate of around one per year. 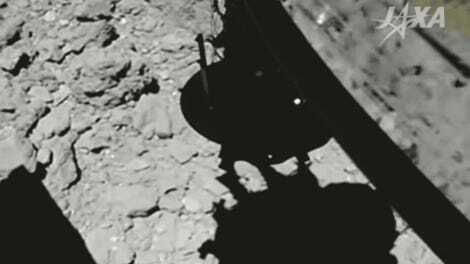 Comets, it’s worth pointing out, produce a tail, or coma, owing to solar radiation that melts off dust and gases. This view of Gault and its two tails includes background stars, which appear as bright streaks. When sunlight heats an asteroid, infrared radiation escaping from its warmed surface carries off angular momentum as well as heat. This process creates a tiny torque that can cause the asteroid to continually spin faster. When the resulting centrifugal force starts to overcome gravity, the asteroid’s surface becomes unstable, and landslides may send dust and rubble drifting into space at a couple miles per hour, or the speed of a strolling human. The researchers estimate that Gault could have been slowly spinning up for more than 100 million years. Importantly, the astronomers found no sign of a nearby object near Gault, which rules out a collision with another asteroid or comet as the cause of the streamers, and further evidence that YORP is the reason for its sudden burst of nihilistic activity. It’s a shame YORP doesn’t happen more often, because I’m suddenly enjoying the word YORP in an unhealthy way. Astronomy needs more YORP. I need more YORP. Anyhoo, it took a veritable village to make and confirm this observation. The tail was first observed on January 9, 2019 by the NASA-funded Asteroid Terrestrial-Impact Last Alert System (ATLAS) telescope in Hawaii. The discovery prompted astronomers to take a look at archival data, and sure enough, there were signs of the tail in both ATLAS data and in observations made with the Pan-STARRS telescope, also in Hawaii. Further confirmations were made with the Canada–France–Hawaii Telescope in Hawaii, the Isaac Newton Telescope in Spain, among other contributors. Followup observations revealed a two-hour rotation period for Gault, which is pretty much the maximum spin rate an asteroid can bear before material starts to crumble and slip away the surface. Dust released from Gault occurred in a few short bursts, ranging from a few hours to a few days. A decent amount of debris was lost as a result; the astronomers estimate that, if all the debris were collected and compacted into a single mass, it would form a rock about 500 feet (150 meters) wide. The resulting tails are surprisingly long. The longer of the two tails is about 500,000 miles (800,000 km) long, and approximately 3,000 miles (4,800 km) wide. The shorter streamer is about a quarter as long. The tails are expected to disappear in a few months. The team will now keep a close eye on the self-destructing Gault, watching carefully for future shedding events and new tails. With more information, the team should be able to devise an estimate for how much longer Gault might last before it completely unravels.